This is an official Glennville, Georgia website. Copyright Crown Designs.org © All Rights Reserved. The property on which the auditorium now stands was given by James J. Barnard on October 3, 1891, to George W. Smith Et. al., as trustees, for the purpose of building a new school or academy. The Tattnall Institute was built as a two story wooden structure which served until 1911 when it burned. Following this another two story building was built to replace it, and it has been in continuous use as a school for the City of Glennville since 1892. In 1916 Glennville was cited by the State Department of Education as on of the first counties in Georgia to have an adult literacy program. This program was called a "Moonlight School", for adults. In February 1938 it was announced that a bond election would be called to raise $10,000, to erect a new auditorium. The building would cost $16,000. In April the voters of Glennville approved a bond issue with 264 for and 12 against. The new building would house a modern auditorium and two class rooms for Tattnall County's largest school. The contract was awarded to the J.N. Bray Co. of Valdosta in early November subject to the approval of the Works Progress Adminstration. The architects were W. M. Walter Simmons and David S. Cuttino, Jr.. Construction began in November 1938, and was completed in March of 1939. The final inspection was made on March 20. Equipment consisting of 700 seats, was installed in November 1939. The Glennville High School Class of 1940 was the first class to graduate in the new auditorium. On March 3, 1992, the City Council appointed three committees for the purpose of fund raising, contributions, grants and historical data. 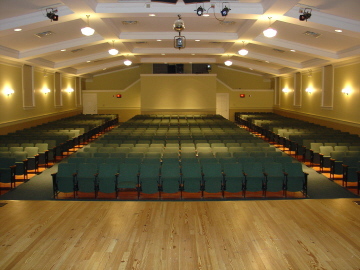 The fund raising committee met September 14, 1992, with election of officers and began organizing to raise funds for the renovation of the auditorium. A mass mailing to all available former students, seeking contributions to restore the auditorium was the next step. This positive reception prompted the committee to seek business, civic, city, county, and state commitments, which also was well received. Having $185,000 in contributions and commitments, renovation construction began on the auditorium. The Department of Corrections provided inmate labor for the renovation, with Glynn Samples, Construction Supervisor, Leland McCall and Joe Kennedy, Directors. Buckley and Associates were the architects, and Ann Allen of Allen Grove Interiors, interior design. Larry Bryant and Ware County inmates were responsible for the unholstery and restoration of the seats. With the renovation completed, the auditorium now houses 568 seats, an enlarged stage, central heating and air, and a state-of-the-art sound and lighting system.